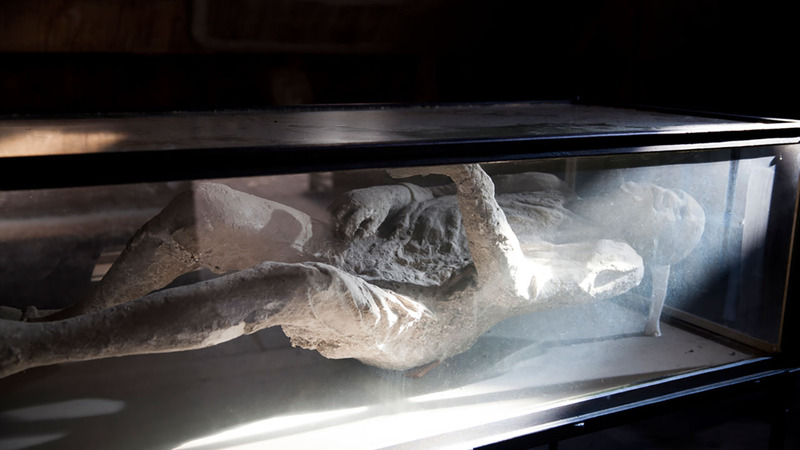 Explore incredible archaeological sites at Pompeii with an expert guide. Relax and enjoy a drive along the Amalfi Coast with a stop at Positano town. Round-trip transport & a friendly English-speaking tour leader remove any hassle. Including air-conditioned round-trip transport, guides and tickets, we’ve taken care of all the details. You'll even have one of our friendly English-speaking tour leaders to accompany you throughout the day, so all you need to worry about is stocking up on limoncello and handmade shoes in Positano. Few places send shivers up your spine like Pompeii, the thriving Roman city frozen in time by the volcanic eruption of 79 A.D. The volcanic ash preserved Pompeii’s buildings, streets, mosaics, and frescoes, making Pompeii a site unlike any other in Italy: It’s a complete ancient city you can explore just as if it were 2,000 years ago! 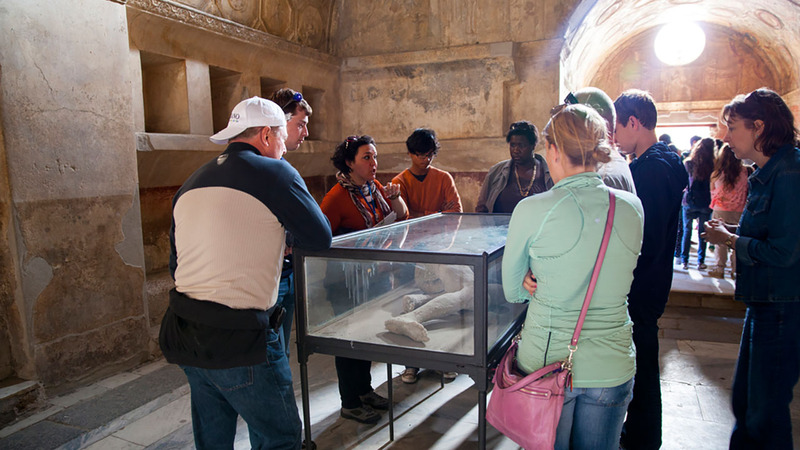 You'll meet your tour leader and comfy air-conditioned bus in Rome and head straight to Pompeii. 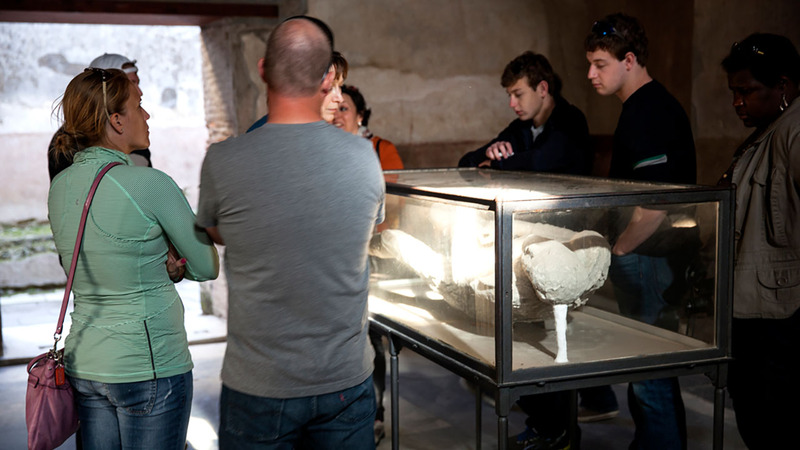 Here your tour leader will hand you over to a certified Pompeii tour guide, carefully chosen from the ranks for their knowledge, enthusiasm and storytelling skills. All of our guides are passionate archaeologists and most have worked on the excavations themselves, so you can trust them to give you the inside scoop. 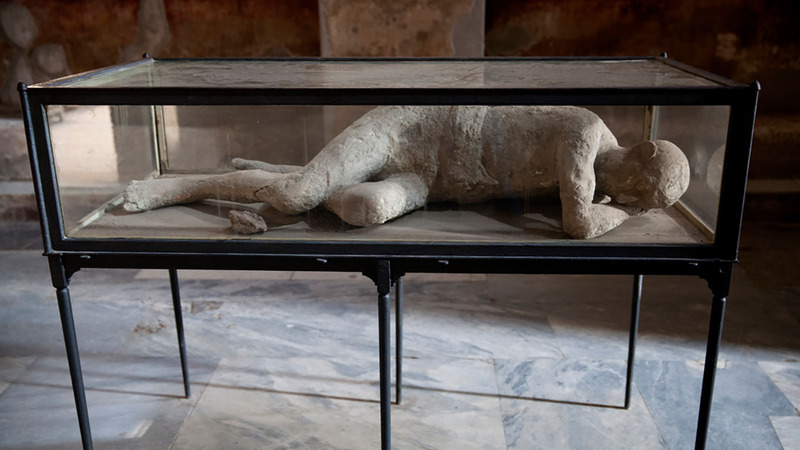 Together you’ll explore the best of Pompeii, from the Roman Forum and the brothel to the world-famous plaster casts of those killed in the eruption. 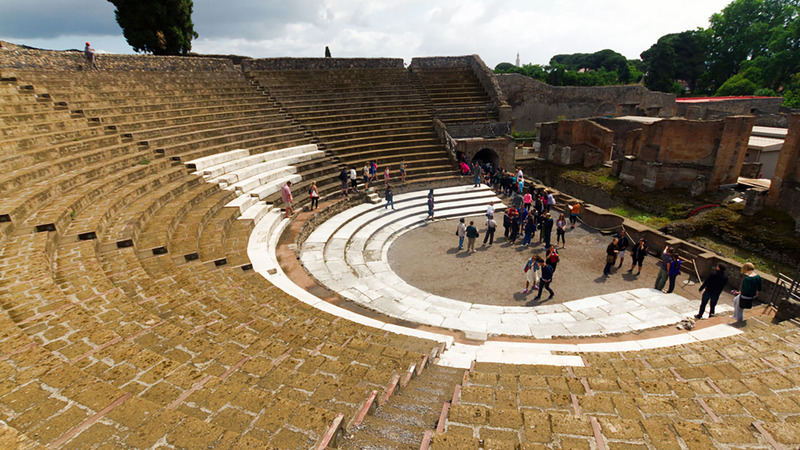 You'll even pay a special visit to Pompeii amphitheater, not visited on most Pompeii tours. Feel the site come to life with your guide’s dramatic stories and fascinating anecdotes about what life was like before and during the eruption. We time your visit to Pompeii to avoid the worst crowds, so either before or after your Pompeii tour, you'll head further south. Your tour leader will accompany you as you revel in the stunning views and exciting twists and turns of a panoramic drive down the Amalfi Coast. Along the way you’ll hear stories about life in this beautiful region of Italy and get some background about our next stop – lovely Positano. A pastel resort town perched on the cliffs, Positano is renowned for its romance and elegance. From the moment you arrive at our meeting point in central Rome to when you return that evening, with a full stomach and head filled with vistas and history, we’ll take great care of you. We’ve organized comfortable, air-conditioned transport in a small bus because larger buses are a nightmare on the winding Amalfi Coast roads. We’ve kept our groups small, with a maximum of only 16 people (often a lot fewer), so your tour will be intimate and you’ll get to know your whole group. PLEASE NOTE: In low season (Nov - Mar), most of the businesses in Positano town close. During this time we will visit Sorrento town instead - another beautiful Amalfi Coast town where you will have ample choices for lunch and shopping. Cossimo was awesome and I had a really awesome time in Amalfi and Pompeii. It was the perfect day trip and everything was made very easy. Very organized and well-planned. The guided tour of Pompeii was wonderful. Pavel was energetic and funny. And Serena at Pompeii was wonderful! Really appreciated Federico and his knowledge about the whole area(s). I would recommend this tour with Federico to anyone! This was an incredible day. Fred was a fantastic guide. He is full of knowledge and stories. Has a great way of talking- I could listen to him all day. And did! Our guide in Pompei was also wonderful. Her name was something like Emilee, and her stories and info. Weâ€™re equally great to hear. She explained so much that we never would have learned touring Pompei on our own. Both Pompei and The Amalfi coast were beautiful! Time on our own was great. I was a little nervous about needing to â€œtoiletsâ€ while out on this long tour. The two stops in Casino were very helpful for that. Everything was well planned. The group size was good. Not too big. Fred provided Rome tips and answered questions on the way back. A really great trip that I highly recommend. Please do not bring luggage on this tour as there might not be enough space in the vehicle. In good weather it is possible (and enjoyable) to swim on Positano beach. We recommend bringing a bathing suit and towel if this interests you. In the winter months we might replace Positano with Sorrento as more shops and restaurants are open there during this time.